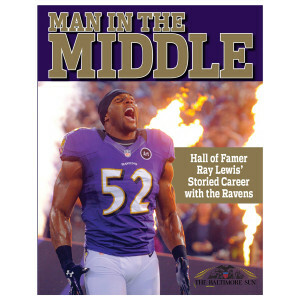 Paperback, 128 pages, 8.5" x 11"
Written by the staff of The Baltimore Sun, Man in the Middle pays tribute to the storied career of Baltimore Ravens Hall of Fame linebacker Ray Lewis through the words and photographs of the award-winning Baltimore Sun. This limited-edition keepsake chronicles the entire career of the 13-time Pro Bowler – from his rookie season to his final game in Super Bowl XLVII. Accompanied by a treasure trove of photos, Man in the Middle is a must have for all Baltimore fans. I gave the Ray Lewis book to our son-in-law. He was thrilled with it. He had not seen it anywhere before, and was so happy with all the great pictures. Just the right amount of info that you need to know. Not too much, not too little. Covers it all including low points and all of the highs!! I would certainly liked to have seen this in a hard-back version, though.